Hi Barbara and Alyce, always interesting to see what inspires other writers and how they work. The book sounds like great fun. Please enter me in the drawing! This was a fun read. It’s amazing how many of us can have ideas working their way to the top over the years, and Ka-Boom- suddenly they’re realized! Thanks, Barbara and Alyce Joy, for sharing. It’s always interesting to hear about the quirks and writing habits of other authors. Taylor and Sprout sound like a fun pair. Best wishes! Thanks to Penelope Anne, Nancy, and Ev for visiting . I’m sure Alyce Joy will appreciate your comments. 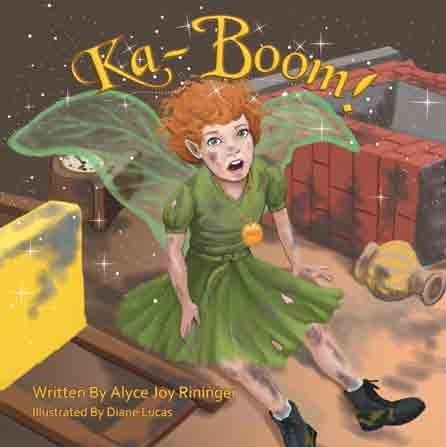 Announcing: the winner of the drawing for Alyce Joy Rininger’s book, KA-BOOM! is Ev. Congratulations, Ev! I know you will enjoy this cute book; it’s a good one to share with grandchildren. Thank you Barbara for having me on Stories a la Mode. What fun it has been for me. I hope Ev enjoys KA-BOOM! Hi Alyce Joy–I’m sure Ev will enjoy your book. It was fun for me, too. Yes! Finally something about cash advance.